The southwest of the Acropolis plateau, right next to the Propylaia, has been an important location of a sanctuary dating back to the Mycenaean era. It is a protruding tall mass of rock, strategically located in a way that protects the south flank of the most vulnerable access point and gate to the citadel. Early in its history it was a place of worship for deities associated with wars, perhaps Bronze Age “Nike” gods or goddesses, which with time fused with the cult of Athena Nike of later centuries. Excavations have revealed that on this location an open pit existed that Bronze Age Greeks used to pour libations and to deposit primitive figurines of the deities worshiped. During the Archaic era a small temple stood on the site that faced an altar to its east. This building was destroyed by the Persians in 480 BCE along with the rest of the Acropolis, and was not rebuilt until 435 BCE. The Classical temple that has survived was completed in 420 BCE. From several ancient accounts and by Pausanias we know the statue of Athena Nike in its cella was made of wood and held a pomegrade in the right hand and a helmet in the left. Since it had no wings, as it was customary for Nike statues of the time, the temple acquired the name Apteros Nike (wing-less victory). It is said that the statue was deprived of wings so it could never leave the city of Athens. The Classical temple is considerably smaller than the other temples of the Acropolis. It is the first building that greets the visitors who approach the Propylaia and its elegant Ionic features balance the dominating Doric character of the Propylaia. It faces to the east and its entrance is lined with four monolithic Ionic columns that support a shallow porch. The west end is similarly treated with four Ionic columns and a porch, but they preceded a blind wall. The inclusion of a tetrastyle (four columns) at the back of the temple was necessary for this side faced the entrance to the Acropolis. 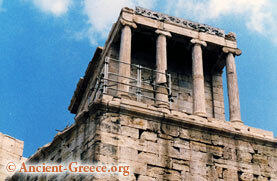 The temple was designed by Kallikrates and is 11 feet tall from the stylobate to the apex of its pediment. As was customary in Attica (but not in Ionia) the temple was decorated with a continuous frieze. The temple's ratio of the column height to its length is 7:1 instead of the customary 9:1 of other Ionic temples. The parapet of the Temple of Athena Nike surrounded the temple and acted as a guardrail to protect people from falling off the steep bastion. It was elaborately decorated by relief sculptures which were seen best by the visitors ascending the ramp towards the Propylaia. It depicted not a coherent story like the Parthenon frieze, but instead it was decorated with a number of Nike relief sculptures in various states of activity. The parapet was built after the temple was complete, perhaps as late as 410 BCE. Much later in its history in 1687, during Ottoman occupation the temple of Athena Nike was dismantled when the “Venetians” besieged the Turks at the Acropolis. The Turks used the stones from the temple to build a bastion next to the Propylaia. The “Venetians” finally forced the Turks to surrender after eight days of intense bombardment, and the temple stones remained as part of the bastion until the liberation of Greece. In 1834 during systematic excavations and rebuilding of the Acropolis by Ross and Hansen the bastion was dismantled and the temple was reconstructed during the next four years. In the late 1930s under the direction of N. Balanos and Orlandos the entire bastion along with the temple was dismantled in order to address structural problems with the sub-structure and was reconstructed by 1940. In 1998 the temple began a new cycle of reconstruction. The frieze was removed and placed in the Acropolis museum, and the temple dismantled completely once again to replace the corroded concrete floor and the iron beams that were present as the result of previous reconstructions.